The streets of Shoreditch are host to some of London’s quirkiest, and some may argue best cafes, and Bulldog Edition is right up there with the best and brightest of them. Nestled snugly within the Ace Hotel, Bulldog Edition is a hive of activity, from local East Londoners to freelancers looking for wifi and a tasty black coffee, Bulldog Edition is brimming with both, and everyone in between. The universal appeal of Bulldog Edition is, in part, down to the communal feel. Comfortable looking couches are placed in loose circles around the cafe which wordlessly encourage patrons to exchange a friendly hello whilst sipping over our signature blend (Red Brick). Chairs adorned with dark cushions are dotted about the establishment which allow for a bit of stand alone comfort away from the communal couches. There are also long wooden tables, stained a charming mahogany, that are perfect for a student or professional looking for an inviting place to work that provides all the essentials – power sockets, wifi and a bit of brain food from the cafe’s seasonal menu (Make sure you get something from the breakfast menu). The interior of the cafe is enhanced further by high ceilings and industrial styled walls which offset nicely with the more intricate details of the cafe, think oddball bicycles positioned in gravity defying locations and 70’s era, art-film fixtures which wouldn’t be amiss in Studio 54. Whilst Bulldog Edition is relatively new on the cafe scene, having been around for a scant 2 years, it’s welcoming nature, stylised yet comfortable set-up allows it to match, if not exceed the appeal of cafes’ that have been around town for decades longer. We began working closely with the team at Bulldog Edition when talks of the cafe first began, assisting with ideas for the style and patron friendly atmosphere, but since then we have taken a back-seat and let Bulldog Edition’s team do their thing, which has resulted in tantalisingly good coffee to tempt any taste buds, no matter what your taste. Whether you’re looking for a comfortable nook to work in, or if you’re just someone who enjoys great coffee in an equally great setting, Bulldog Edition is the place for you. 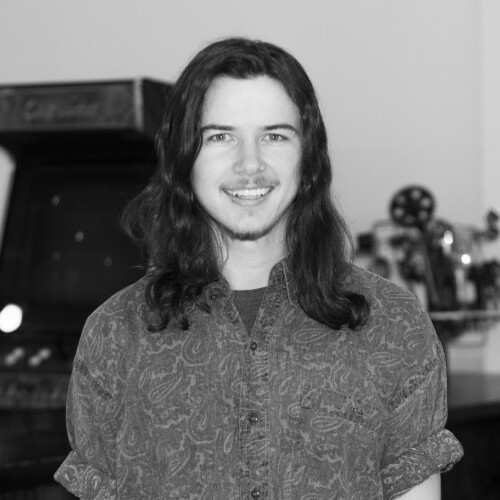 Ben Mayo was our resident graphic designer until the summer of 2015 and has now moved home to Australia. He still has a keen interest in coffee and photography.